The pepper-mill and mustard-pot each waisted cylindrical and with pierced sides, the salt tapering, each with glass liner, the pieces finely engraved, the pepper-mill with a representation of Adam and Eve, Eve presenting Adam with an apple which explodes into a mushroom cloud; the mustard-pot with symbols emblematic of heat, to reflect the heat of the mustard it is designed to contain, the cover with glass finial, the base pierced with a cockatrice; the salt pierced and engraved to represent regeneration, the pieces made by Hector Miller. 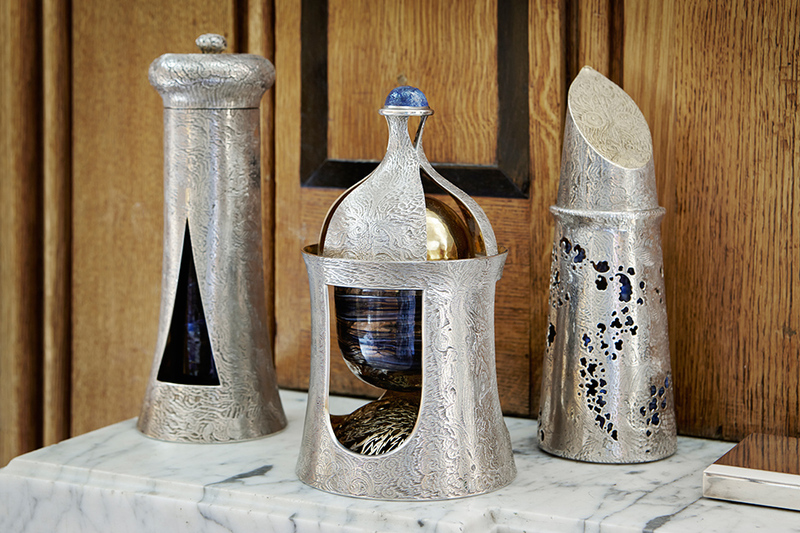 This three-piece condiment-set was the first commission by the Trustees of the Silver Trust, being delivered in 1987, the year after the founding of the Trust. It remains one of the iconic objects in the collection and an important addition to the oeuvre of one of the most innovative engravers working today. John Andrews and Derek Styles, Designer British Silver from the Studios Established 1930-1985, Antique Collectors’ Club, Woodbridge, 2015, p. 64-65, illustrated p. 65. Malcolm Appleby was born in West Wickham and trained at Beckenham School of Art, Ravensbourne College of Art, Central School of Arts and Crafts, Sir John Cass School of Art and the Royal College of Art. He started his career as an engraver in 1968 developing new techniques for silver engraving and gold fusing onto steel. Having started his career as an engraver in 1968 Malcolm is now the foremost engraver in the United Kingdom. His many commissions include the 500th anniversary silver cup for the Goldsmiths’ Company and a centrepiece for Bute House in Edinburgh. He has also made the seal for the Victoria and Albert Museum. Malcolm was appointed an M.B.E. in 2014 for his services to hand engraving.